There are three methods you can use to import users into one of your managed accounts. To do this, you will first need to log into one of your managed accounts. This can be done by clicking on the Accounts tab and then clicking on the Display Name of one of your accounts. 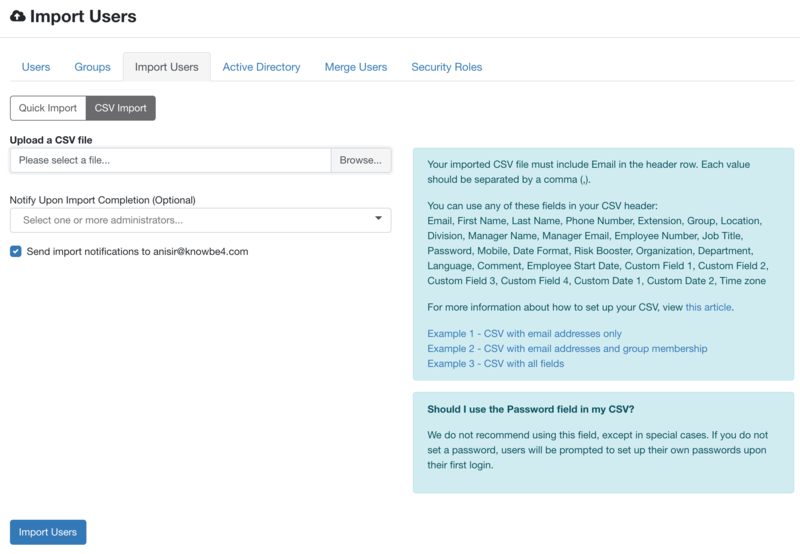 From here, you can import users to that specific account through quick import, CSV import or Active Directory Integration (ADI). Click on one of the methods below to learn how to use it to import users for your managed account. We strongly recommend using ADI if that is compatible with your managed accounts, as this is the most efficient way to keep their user list up to date and matching their environment. If ADI is incompatible with your managed account's environment, the next most common method is to import users by uploading a CSV file. You can do this by logging into one of your managed accounts and navigating to Users > Import Users > CSV Import screen. As an Account Manager, you will have the option to choose who you want to notify of the import completion by using the Notify Upon Import Completion drop-down. Here, you can select to send an import completion notification to All Console Admins, None, or a specific admin on your managed account. This option may be useful if you have a managed account that would rather not receive these notifications. As well, there will be an option to send an import notification to yourself (the user currently logged in) by checking the Send Import Notification to checkbox.